The Library Resource Center, Nā Waihona o Laka me Lono, presently serves the students, faculty, and staff at the Kamakakūokalani Center for Hawaiian Studies, one of the four hale of the Hawai’inuiākea School of Hawaiian Knowledge. To access the guide to Kamakūokalani Center for Hawaiian Studies Resource Center, click here. In 1986, the Kaʻū task force brought forth the idea of a “Lumi Waihona Palapala Manaʻo,” a repository to support Hawaiian Studies curricula, faculty, and student research. With the dedication of the Kamakakūokalani Center for Hawaiian Studies in 1997, Professor Lilikalā Kameʻeleihiwa named the various rooms within the kauhale, dedicating the library to Laka and Lono, akua of learning and knowledge. For the 21st century, we now present NĀ WAIHONA O LAKA ME LONO. Famous are you Laka: Laka the storyteller, the documenter, the historian. E Laka ē! Laka of the forest, the tree cutter, the chip-maker. E Laka ē! E kū mau mau. Laka our sister. Laka our brother. Laka, dancer through time. I ka makahiki: Lono the man, Lono the chief, Lono the god. I ka makahiki: Lono of the dark clouds, of the rain, of the forests. I ka makahiki: Lono the jealous husband, Lono the murderer, Lono the madman. I ka makahiki: Lono of the harvest, of the warless months, of the games. I ka makahiki: The grounds are ready, kai moana awaits, and Lono speaks. Our mission at Nā Waihona o Laka me Lono is to support Hawaiʻinuiākea School of Hawaiian Knowledge, promote academic excellence, perpetuate Hawaiian ancestral wisdom, and emphasize Native Hawaiian perspectives in all areas of study. Our resources represent the interplay of history, culture and politics as well as the interconnectedness of all knowledge, contemporary and ancestral, from Kanaka Maoli perspectives, in order that students will understand Kanaka Maoli experiences in the context of world indigenous peoples. The community is welcome to come in and browse through the physical collection. In partnership with Nā Hawaiʻi ʻImi Loa and Mānoa’s Library and Information Science Program, Laka me Lono Resource center presents “Hoʻokele Naʻauao: A Hawaiian Librarianship Symposium” every fall. The symposium has several purposes. One is to increase the number of Native Hawaiian graduate students in the LIS program, and create collaboration between that program and Hawaiʻinuiākea, as well as promote Hawaiian librarianship in the 21st-century. 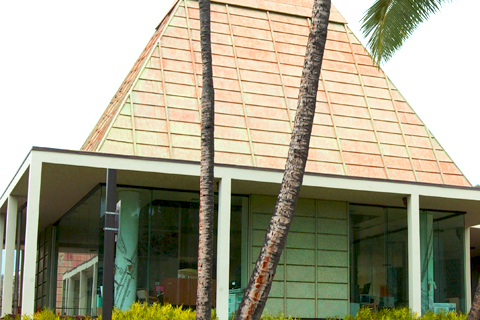 The symposium generally begins at Hamilton Library, home of the Hawaiian and Pacific collections, then moves to Kamakakūokalani. The afternoon sessions feature panel discussions meant to encourage student engagement, as well as discussions of Hawaiian and Indigenous librarianship practices and professional development. Kauwela Valeho-Novikoff, librarian of Kamakakūokalani’s Laka me Lono Resource Center, says the symposium shows students culturally-based aspects of library and information science while de-mystifying it and showing its relevance to Hawaiian culture. For information about the latest symposium, visit the “Hoʻokele Naʻauao” website.